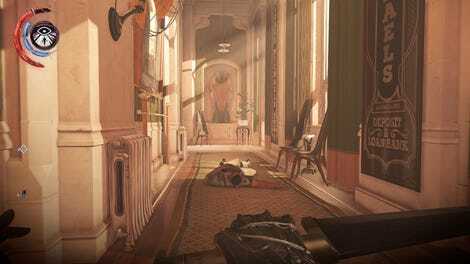 Dishonored has always been about the journey more than the destination, discovering secrets in its levels and finding creative ways to fulfill its objectives. Death of the Outsider, the game’s new standalone DLC, stays true to this strength. It doesn’t reinvent the game, but it doesn’t need to. Narratively, Death of the Outsider fits with Dishonored 2 and Dishonored 1’s DLCs, The Knife of Dunwall and The Brigmore Witches. It stars Billie Lurk, the boat captain from Dishonored 2. The game opens with her rescuing Daud, assassin of Dishonored 1’s empress and her mentor in the series’ first DLCs. Daud has one last job for Billie: killing The Outsider, the emo trickster god on whom they blame the grim, bloody disasters their lives have become. Setting out to kill The Outsider obviously means not receiving his mark, which was the way the previous games gave players supernatural powers. Billie still gets powers, but they don’t require choices, runes, upgrades, or potions. Displace is Death of the Outsider’s version of Blink, allowing Billie to create a shadow clone and then warp to it. Foresight is a sort of Dark Vision, which Billie can use to scout ahead and get through certain obstacles. Semblance is a kind of Possession, letting Billie grab people’s faces and move through hostile areas. You don’t choose new powers or upgrade them. This means not being able to build your own character, but it also does away with the annoyance of equipping the heart and searching for runes. None of Billie’s powers are that fun on their own, lacking the panache of the previous games’ wilder abilities (some of which can be played with in the DLC’s “Original Game Plus” mode), but using them in combination with gadgets or the environment makes you feel like a clever assassin. There are a few new gadgets as well, in addition to the familiar rewire tools and spring razors. Hook mines are non-lethal mines that yank NPCs toward them, and they’re hilarious. The non-lethal hyperbaric grenade is a great tool for no-kill players trying to take out groups of enemies. The crossbow is replaced with the voltaic gun, which has lethal and non-lethal options. As with Billie’s new powers, none of these reinvent Dishonored on their own. They’re largely reskins of the tools you’d expect to have in a Dishonored game, familiar enough that players don’t get bogged down in learning a bunch of new skills for the relatively brief DLC. "Nietzsche would have a field day." Well-designed levels, interesting side missions. Dull plot, characters who are difficult to relate to. Death of the Outsider has five missions, one of which reuses a location from Dishonored 2. They largely involve stealing keys or finding information rather than assassinating targets, with the obvious exception of The Outsider. Most of the missions are filled out by contracts, optional side quests that earn you coin to spend on supplies and upgrades at black markets. These contracts are sometimes more interesting than the main missions, requiring exploration and creative thinking. One contract, for instance, tasked me with assassinating a mime while making it look self-inflicted. I spent a good chunk of my six hours with the game perched above the mime and his audience, trying to devise non-lethal ways to clear out the spectators so I could knock him out and throw him over the required cliff. Through several restarts I eventually learned the way he’d run if frightened, placed a hook mine there, and then scared his audience by throwing things and being generally menacing until they all took off in different directions, sending my mime right into my carefully-placed mine. Other contracts are equally fun, with steep challenges and lots of room for devising your own solutions. By contrast, most of the story missions had multiple points of entry, but they weren’t quite as flexible as the contracts or the missions in the previous games. Despite its evocative setting and rich lore, plot has always lagged behind Dishonored’s level design, and Death of the Outsider is no different. While Death of the Outsider doesn’t have many locations, the new ones are complicated and thrilling, full of secret pathways, beautiful art touches, and multiple ways to circumvent obstacles. Revisiting a level from Dishonored 2 is exciting in its new context, populated by different enemies and with different objectives to pursue. The game’s second level has multiple objectives, and a later bank heist features several puzzles and newly-designed Clockwork Soldiers. A late-game mission introduces a terrifying new enemy; discovering its weakness made me feel brilliant. Honestly, I bounced off most of the main plot, but the small, self-inflicted adventures I had stayed with me. Those are the moments when Dishonored is at its best, and Death of the Outsider creates plenty of ways to have them. Even main character Billie isn’t that interesting, despite my excitement at getting to play a lesbian of color assassin with a magic arm. Her character suffers under Dishonored’s standard long cutscenes and boring moral choices. She and Daud grapple with regret and who to blame, ideas that should be relatable but just aren’t that affecting. Billie gets her best characterization in the player’s hands, becoming a gruesome killer or a merciful stealth god. She lives the game’s themes through play in ways much more dynamic and engaging than anything the dialogue and story could cook up. Ultimately, Death of the Outsider is just more Dishonored. Dishonored excels at being a blank slate for players’ creativity, and while Death of the Outsider doesn’t do anything to change that, it doesn’t ruin a good thing.